Who is actually working on your case? Are you talking to a licensed attorney or to a salesperson? Different types of people work on cases before the IRS including attorneys, CPAs, accountants, bookkeepers and enrolled agents. There are even individuals representing taxpayers who are not licensed to practice before the IRS. Verify the credentials of the individual or firm you hire and be sure they are licensed to practice before the IRS. Although there are exceptions to every rule, we strongly recommend staying away from unlicensed accountants, bookkeepers and/or enrolled agents. In our experience, these people deliver an inferior level of service. Many out-of-state tax firm chains use salespeople to entice you to use their services where you are represented by overworked, underpaid and inexperienced staff. At Chicago tax attorney Patrick T. Sheehan and Associates, only a licensed attorney will work on your case. There are some tax resolution firms that “guarantee” a positive resolution to your case. Unfortunately, it is unethical for an attorney or one licensed to practice before the IRS to guarantee any outcome in any case. 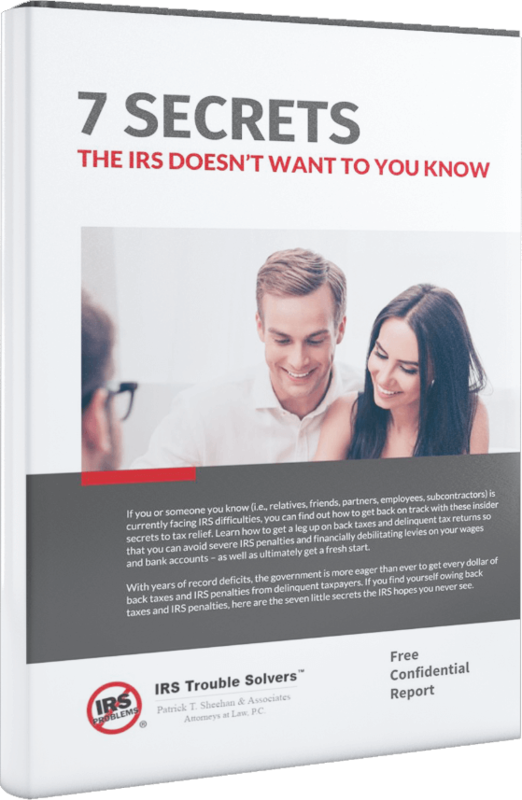 Although guarantees are certainly appealing, one can never guarantee the outcome of any case with the IRS. If it sounds too good to be true, it probably is.